I t’s freezing at Khardungla Top, at 18, 340 ft above sea level. Here, on the highest motorable road in the world, sits Shivani Gupta, one of the three friends who set up ‘Journeys without Barriers’ (JwB), an accessible tourism venture. 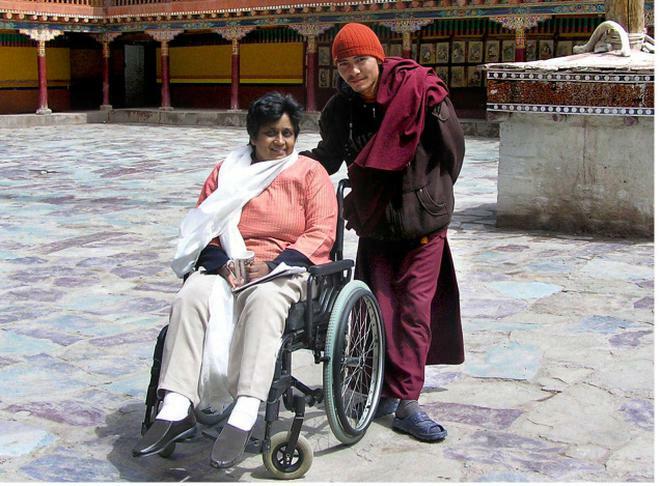 If Shivani, in her wheel-chair, made it to this beautiful place in Ladakh, then it is proof that thousands of physically-challenged and senior tourists too can enjoy such outings. Shivani has been a quadriplegic now for 18 years, ever since she met with an accident that injured her spine, and has been working with several organisations to improve accessibility. “Leh’s natural beauty is so magnificent and overpowering, that it completely humbles you and spreads a sense of peace and calm. No wonder I survived so well, without mobile connectivity and without worrying about time comfortably for those six days. Each mountain in this dry land is of a different colour. Each view is such that you would want to photograph it,” says Shivani, also the director of AccessAbility, an accessibility and disability employment consultancy. “Journeys without Barrriers” grew from a passion for inclusiveness, and the available pool of expertise in the field of architecture, management, disability and tourism. JwB owes its birth to several related organisations, one of them being Himalayas on Wheels (HoW!). The driving force behind HoW! is Mohammad Iqbal, a severely disabled person, avid traveller, and president of People’s Action Group for Inclusion and Rights (PAGIR). The organisation, based in Ladakh, works towards creating an inclusive and prejudice free society and through its network across Leh district provides a single window of information, opportunities for training, livelihoods and for marketing products. This work is supported by a team of volunteers bringing together people with disability and those who are physically able. It was while accessibility professional Vidhya Kalyani worked with Mohammad Iqbal and his team that they came up with the idea of starting a tourism venture that would not only create jobs for the local people with disabilities, but also widen the world for disabled persons who dreamt about seeing the Himalayas and many other parts of the country. While HoW! promotes inclusive tourism in the Ladkh region, JwB is ramping up its bank of associates to be able to offer travel packages across the country. JwB’s focus will be on least restrictive travelling. Travellers with disabilities will enjoy the experience of visiting a new place, have a comfortable stay and absorb the culture and environment of the area — all with minimal restrictions to their travel and mobility. JwB ensures basic accessibility in all the services, like accommodation and travel. It will provide physical assistance where necessary, say while transferring from a vehicle, crossing the road, and ensure safety within the services provided, safe transfers to and from the wheel chair, and safety while walking and climbing. The company has partnered with service providers who can provide such facilities to this group of travellers. Both HoW! and JwB are ventures supported by Travel Another India (TAI), a responsible tourism company that recently won the Cartier Women’s Initiatives Award in France. Along with Shivani Gupta and Vidhya Kalyani, Gouthami, one of the founders and CEO of TAI, is the important third that makes up JwB. With over 18 years of experience with international and national development agencies such as ActionAid, Concern Worldwide, Christian Aid, and Kutch Mahila Vikas Sangathan, she was part of the team that set up the Shaam-e-Sarhad Rural Resort in Hodka village, Kutch. Shivani is an experienced accessibility professional now. But she knows how bad things can be for a person with disabilities, and how troublesome badly-constructed rest-rooms can be. Shivani was a confident 22-year old when she had an accident. It took her two years to rehabilitate, and to come to terms with the reality that she would never be able to use her limbs normally.. She went on to do a course in peer counselling in the United Kingdom, and started working for the Indian Spinal Injury Centre in New Delhi. While at the centre, Shivani attended a workshop in Bangkok on barrier-free environment. “This opened my eyes to the world of architecture and the challenge that I saw for myself…an urge to do something about this in India,” recalls Shivani. She did a two year course in architectural technology in Delhi, and followed it up with a post-graduate course in inclusive environment. Her expertise in barrier-free built environment, and her own physical disability led her to manage several accessibility projects with professional zeal.